ENGLAND FOOTBALL HOOLIGAN Joe Pizarro was banned from attending any football matches for five years after being involved in violence prior to England’s Euro 2016 game with Russia, a court ruled yesterday. The 34-year-old was caught by British police when they viewed footage from June 10 on the eve of the 1-1 draw in Marseille. Violence dogged the days leading up to the game before Russian fans attacked England supporters inside the stadium after the match. “The vast majority of travelling British fans are well behaved and in France to enjoy the tournament,” Detective Superintendent Andy Barnes said. “Sadly a small minority have engaged in disorder. This will not be tolerated. By acting quickly we have prevented this man from travelling back to France to cause more trouble. What’s more he will not be able to cause trouble at games in the UK either. Russian fans are at the centre of a French inquiry into disturbances around the game with England that left two English supporters fighting for their lives. 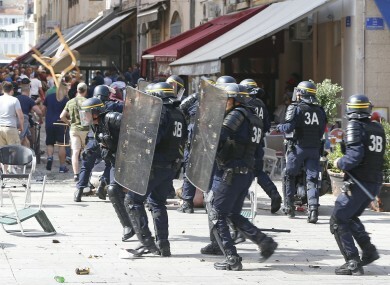 England supporters Andrew Bache, 51, and Stewart Gray, 47, remain in comas, French officials said. Robin has said much of the violence was provoked by Russian fans. Two England fans, though, were jailed on June 13 for their roles in the violent and distasteful scenes. Ian Hepworth, a 41-year-old psychiatric nurse, was sentenced to three months in prison. Alexander Booth, a 20-year-old chef, was jailed for two months. However, England did not emerge unscathed from the blame game with European governing body Uefa threatening to kick both teams out of the tournament if there was more trouble inside the stadiums. The Russia football team’s woeful performances have subsequently done Uefa a favour by seeing them eliminated at the group stage — England have a last 16 date with Iceland on Monday. Email “5-year ban for English hooligan after Marseille violence”. Feedback on “5-year ban for English hooligan after Marseille violence”.